Shares in Debenhams plunged 17% after the troubled retailer called in advisers as it considers plans that could lead to the closure of stores. Debenhams is considering a list of options that include a company voluntary agreement (CVA), a controversial way to reduce debts and close stores. Other options the firm could be looking at include renegotiating leases on stores that are up for renewal, selling off its Danish arm Magasin du Nord and giving up space in some of its large stores. The company has brought in KPMG to help draw up the turnaround plans, according to The Sunday Telegraph. Debenhams chairman Ian Cheshire said: "As we started in June, the board continues to work with its advisers on longer-term options, which include strengthening our balance sheet and reviewing our non-core assets." Debenhams also updated investors on its trading performance, saying it expects to report pre-tax profits of around £33m this year, within the current market range of £31m to £36.5m. The retailer also expects earnings before interest, tax, depreciation and amortisation of £157m and year-end net debt of about £320m. Chief executive Sergio Bucher said: "The market environment remains challenging and underlying trends deteriorated through the summer months." CVAs have been used by a number of retailers, including New Look, Carpetright and Mothercare, to seek creditors' permission to close stores and slash rent bills. The use of CVAs is unpopular among landlords who have seen rents slashed by up to 90%. David Cheetham, chief market analyst at Xtb, said: "The firm has lost two-thirds of its market value in 2018 alone, as it issued three profit warnings and has announced a series of job cuts and it now appears to be seeking outside help in a bid to stop the rot. "Debenhams has been a stalwart of the British high street for more than a century but its recent decline is in keeping with broader troubles for bricks and mortar retailers that have failed to adapt to the rise in e-commerce. 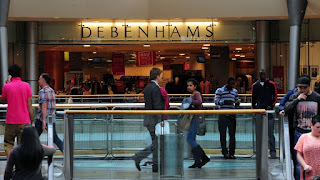 "These troubles are widely known and Debenhams has been one of the most widely shorted stocks on the LSE (Londons Stock Exchange) of late with more than 10% of the float currently believed to be out on loan to those betting on its share price to fall."